A Stunning Iris Fluted Sleeve Dress and My Daughter’s Sixteenth. 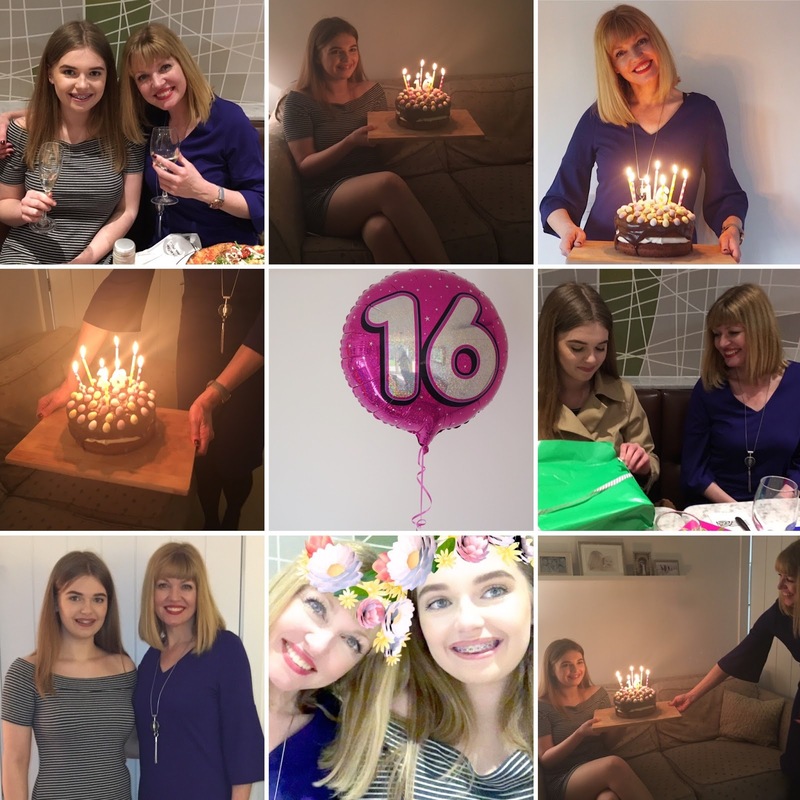 If you follow me on Instagram, you might have seen that my daughter celebrated her 16th birthday last week. We’ve had a wonderful few days with friends and family and of course yesterday was Mother’s Day. The children and I went out for brunch. Afterwards, because it was a gloriously sunny day, I spent the afternoon outside tidying the garden and cleaning the patio furniture. I must be honest and say that after such a lovely weekend, I’m finding it difficult to come back down to earth and focus on work today. It feels like it’s the first day back after a holiday! I have a very busy and exciting few weeks coming up on a personal level, (my children both have foreign exchange students coming at the end of this week for a week,) and with my magazine work and my blog. The lovely thing is though that much of the upcoming magazine work is the ultimate combination of business and pleasure and lends itself to being shared on my blog too. I’m having a working lunch later today at Stirk House, a renowned hotel just 20 minutes from where I live. This talk of lunch leads me nicely into what I wore on Friday night for my daughter Poppy’s birthday meal. 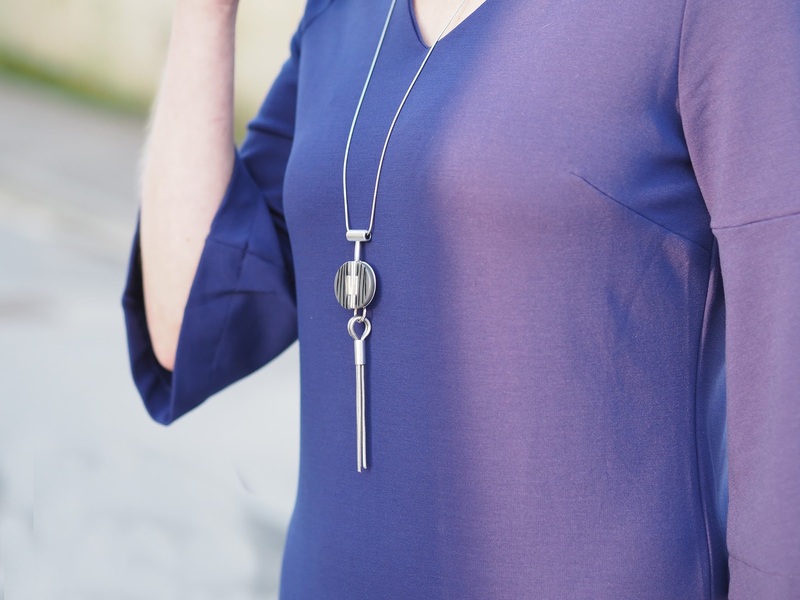 We ate out with some close family friends and I wanted to wear something dressy but also something comfortable, so I decided upon this iris dress by Finery London. The Aintree Flute Sleeve Dress is just £45 and is made from a medium-weight jersey. It’s the perfect piece to throw on because it needs little more than a pair of shoes and some simple jewellery to complete the outfit. It’s very easy to wear because it doesn’t have a structured waist or fastenings, yet, because of the cut, it looks elegant and stylish and the vibrant iris colour is absolutely stunning. 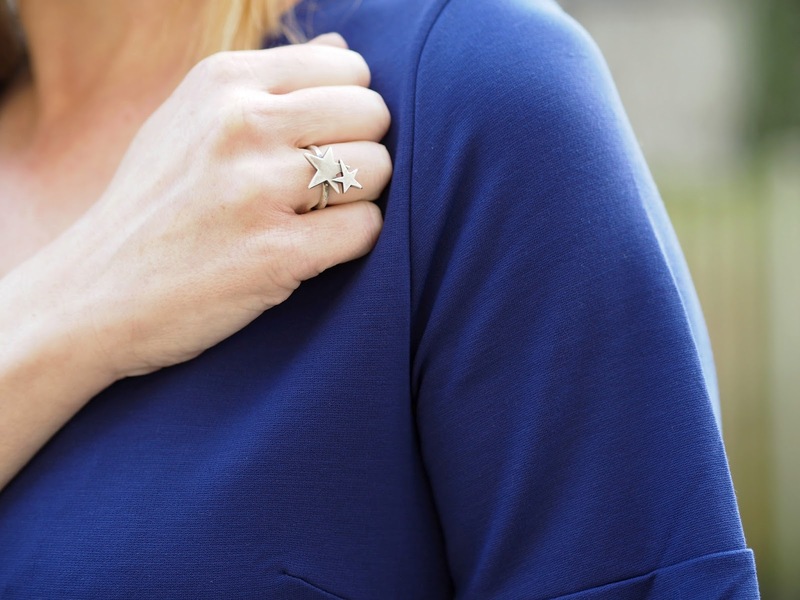 The star ring is by Danon and is from my boutique. It’s one of my all time favourite rings and it also comes in matte gold. Do head over and take a look because there are some gorgeous pieces, (even if I do say so myself!). I’ll leave you with a collage of photographs from the birthday weekend. Poppy is currently studying hard for her GCSEs. She’s smart and intelligent and has infinite patience with her 13 year-old brother and with me when taking my blog photos. Like all teenagers, she *occasionally* forgets to wear her halo and parks her angel wings, but she’s a good girl. I always feel emotional at the milestone birthdays of my nearest and dearest and this was no exception. It’s a privilege to be her mum. Pewter metallic clutch bag, Boden, past season. Pewter shie boots, several years old. Previous Post A Review of Esthederm Skincare and Bioderma Hand Cream. Wonderful dress! I love the color and this design so simple. The outfit is perfect. 100 YEARS OLD WOW that is something extraordinary I wonder if she has a secret to longevity? Very pretty Lizzy. I love the sleeves and cobalt color. Do they ship to the US? I've said it before, blue is definitely your colour! You look wonderful, and what a lovely day you had with Poppy. She looks so grown up and pretty – like mother, like daughter.